SNA produces a variety of publications to help you learn about the field of school nutrition. Purchasing Online: Use the following links to purchase theses publications through SNA’s online shopping cart. 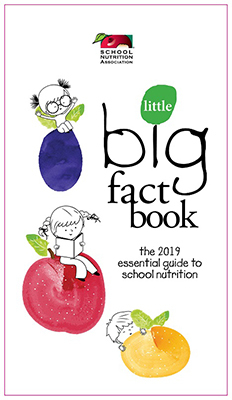 SNA’s Little Big Fact Book is a valuable, easy-to-use reference booklet with critical information about school nutrition programs in a compact resource. It features facts about the federal programs, USDA Foods, the school market and a variety of hot topics. It is designed to assist foodservice directors/managers, school administrators, foodservice brokers, marketing/sales teams, state/national legislators and the media understand the complex school nutrition business. 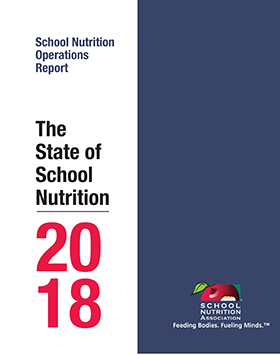 The 2018 report benchmarks operational practices of school nutrition programs. The report includes information on meal prices, participation rates, lunch and breakfast venues, nutrition education initiatives, food and beverage trend as well as plans related to construction and equipment purchases from more than 1,500 school nutrition directors. The Executive Summary of the report is available for free to SNA members. 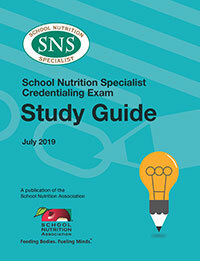 School Nutrition Specialist Credentialing Exam Study Guide – 2017 Edition The purpose of this study guide is to help you prepare and assess your readiness for the School Nutrition Specialist (SNS) credentialing exam. Individuals who earn the SNS credential demonstrate the knowledge and competencies necessary to manage school nutrition programs in today’s challenging climate. Note: Using this study guide alone will not guarantee passing the SNS exam. The guide will direct you to content and resources that will help you prepare. 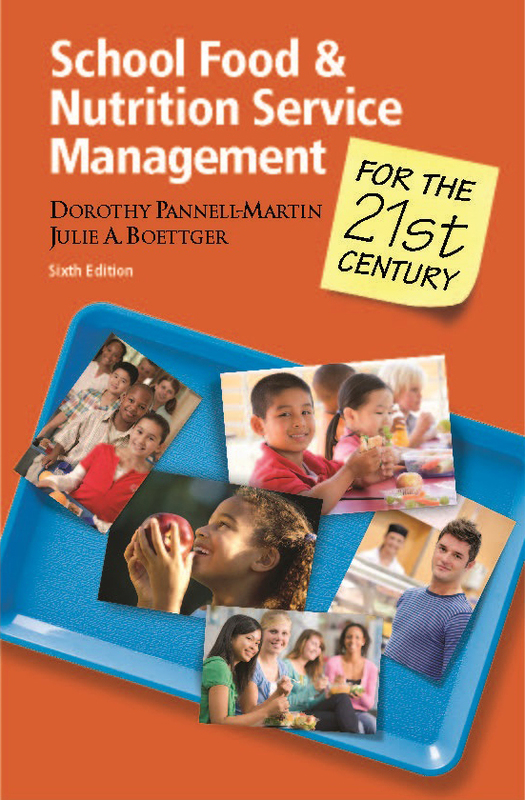 The newly updated 6th Edition of this comprehensive textbook, is THE go-to reference book for those working in the field of school nutrition. The book is a key resource for SNS exam preparation, and includes chapters on current regulations, financial management, menu planning and nutrition, human resources, equipment and facilities planning, procurement, production management, food safety, technology and marketing. Each chapter opens with a story from a school nutrition practitioner describing how the subject applies to their career. Special Offer: SNA is offering a members-only SNS preparation bundle, which includes both the School Nutrition Specialist Credentialing Exam Study Guide – 2015 Edition and the School Food and Nutrition Service Management for the 21st Century – 6th Edition. This special introductory offer is available to SNA Members only for $109 + $6 S&H (Non-members $138 + $6 S&H). Chronicles the history of the Association from its move from Denver to the Washington, DC, area in 1988 to the present-day drive for uniform, national school nutrition standards. Written by Patrick White. A compilation of examples of school nutrition programs and their allies in the school and community who have used their Local School Wellness policy to make positive changes to their school environment. Are you hungry yet? These recipes and more can be found in the recently published SNA Past Presidents’ Recipes with Love Cookbook. The cookbook was released at the 2008 ANC in Philadelphia.